I think it is SO SO important to make your office space super cute, happy and personalized. You spend the majority of your time at work so why not make the most of it and make sure you feel happy and motivated when you're sitting at your desk. I think my biggest tip in decorating your work space is to focus on adding dimension. Think more than just pinning up some pictures and calling it a day. Put your pictures in picture frames, use some fun string lights, etc. My favorite places to shop at for cute office/home decor: TJ Maxx/Marshalls/Homegoods (my fav), Target (dollar section has been killin' it recently for back to school), Urban Outfitters. 1. Polaroids // Photobooth pictures. I think it's fun to have a mix of both! 2. Fun coffee mugs - I keep at least 2 at my desk. TJ Maxx/Marshalls/Homegoods has THE BEST MUGS for so cheap. 3. A cute calendar - SO much better than the free calendars they offer you at work. 4. Postcards of your favorite places - mine are Door County, Iowa City, and Kansas City. They each have a special meaning to me. 5. Motivational quote/print - I have a print that says "I Can And I Will" that I love! Just the right amount of cheesy, ya know. 6. Picture Frames - I love the look of a pretty picture frame in addition to some Polaroids and photo booth pics. 7. Fake (or real!) flowers, plant or succulent - Shhh, my succulent is fake. 8.Magazine holder - a CUTE place to shove all your junk away. 10. Coasters - I don't konw what it is about coasters but they make me feel like a real adult. Also, there is nothing worse than an annoying water ring from your iced coffee. 11. LED Sign - OMG. I just got this for my new desk and I am obsessed. By far my favorite section of my desk. 12. Business Card Stand - I never even got new business cards when I changed jobs but I still love my business card stand. 13. Mouse Pad - Again, I think I got one from work but it was boring and ugly so I immediately got a new one. 14. Embroidery Hoop - This is also one of the new additions I got to my new desk. I'm obsessed with these! 15. Balloon Animal - So I don't have one of these but I've been wanting one for my desk or to add somewhere at home. SO cute! 17. Letter Board/Lightbox - just a cute lil way to display any message you're feeling for the week. 18. Cute Office Supplies - I'm really into acrylic office supplies. Acrylic is so chic and cute and it will match with any and all decor you have on your desk. Also, Kate Spade has really cute (and practical) office supplies. 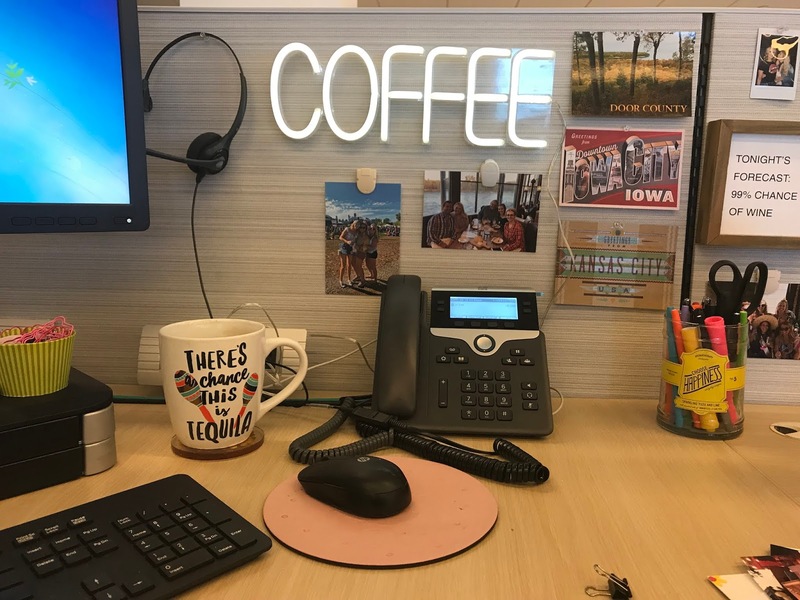 19.Funny Desk Sign - These are so cute and make a great gift for anyone you know who just got a new job! Any extra personalized little trinkets. I have a jar of my college sorority that I use as a 'memory' jar as well as a tin beer can from a brewery that I visited in Austin, TX that says 'Little Boss' that I thought was cute and motivating for the workplace. You can also dedicate a little section/corner of your desk for any products you keep at your desk. I always make sure I have a Mario Badescu facial spray, hand sanitizer, and some hand lotion, etc. Some cute/fun cards you've received. I have a card from my best friend congratulating me on my new job as well as a card from the flowers I got from Matt for our anniversary. How do you keep your desk decorated at work? Aw I love what you did with your office space! It really makes a difference with productivity when you have the space just the way you like it! And the candle turned into a pencil holder is a genius idea! Such a beautiful place to work. Awww, this is a wonderful way to personalize office space. You're right about it being important to do so since so much time is spent there. Your office space looks really nice and inviting! So important if you spend hours there! Same here! And it doesn't ever stop me from picking up more ha! So cute! Your office space looks great! Your office space is so cute. I loveeee polaroid and photobooth pictures so much. I've been trying to collect as many photobooth stripes as I can, it's become a tradtion to always stop and take photos in one. Aw thank you so much! And what a great tradition! I definitely take advantage of all the photobooth opportunities at events like weddings and such! OMG, I would be SOO upset about that! What a silly rule! Such a lovely selection! That golden balloon dog is so cute, I have to get me one of this. Such a gorgeous office you have here dear! I love the lamp and the Coffee mugs, looks really fun. Your desk is so cute! I have been trying to spice up mine but it gets so messy haha. I'm gonna bookmark this post for desk inspo. I think adding personal touches to your work desk makes work so much more easy and fun. I love your ideas. Oh yes, this is such a pretty and functional space. I like how you personalised it with things that are useful, cute and fun. 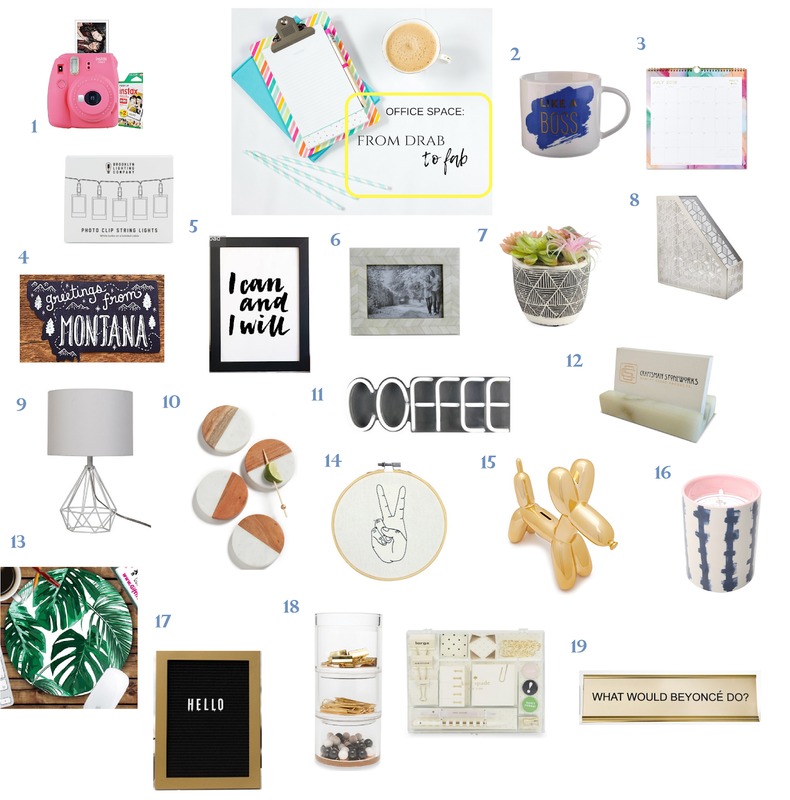 I am just finishing my home office space and am LOVING all these finds! That "I can and I will" print is SO necessary! Aw, thank you so much! That print is my fav! That was last month but thanks hah! Love how nicely you have your work space organized and decorated. Totally love the office. I always believe that having it nicely decorated increases productivity. Good job! I definitely feel more motivated in a cute and clean area! Thank you!! OMG your office is so cute! I just started a new job 2 months ago and totally need to jazz it up! Aw, thank you so much Cris! I'm so happy with how my desk turned out!! These are all such cute ideas! I love the lamp!